At the start of the war in 1914, the shortage of weapons was keenly felt. 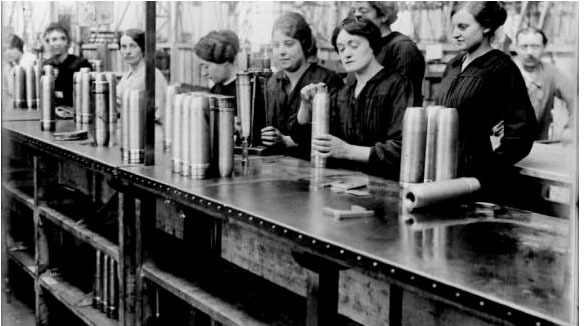 Manufacturers had to be mobilised and workers called back to urgently produce weapons and munitions. In September 1914, the French government, which had withdrawn to Bordeaux, appointed Louis Renault coordinator of the industries along the Seine for the manufacture of shells. By January 1915, his factories were back to their pre-war numbers. He spared no effort to encourage industries to cooperate on a national level and find rapid, efficicient production techniques. In March 1915, he founded and led the Light Weapons Consortium in order to organise the production of parts for Lebel rifles. The Renault factories contributed significantly to the war effort and produced 500,000 rifle parts, 8.6 million shells (75 and 55 mm), 5.5 million rifles and detonators, 1,000 cannons, 13,500 engines and 1,500 aircraft, not to mention 20,000 vehicles and 2,000 FT tanks.